This is a place from my home town which I used to frequent as a student 30 odd years ago. Nice informal sort of establishment that didn't ask too many questions about the age of a group of spotty 6th formers. I had completely forgotten about it until I read this piece. Bottom of Portswood, far end of Bevois Valley - if you last saw it 30 years ago, you probably wouldn't recognise the area. It's all student accommodation and Aldis now. Oh I still go past that area. My parents live nearby. Havent patronised that particular establishment for many years. In fact I cannot remember the last time I went to a pub in Southampton. If I want a pub when I am visiting I go to Winchester. I wonder if it's twinned with this place? 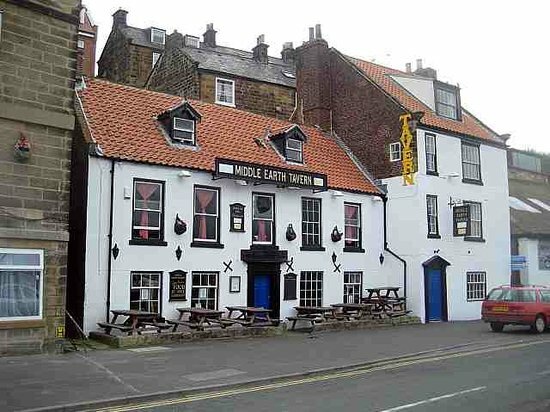 Middle Earth Tavern, Whitby: See 94 traveller reviews, 9 candid photos, and great deals for Middle Earth Tavern, ranked #15 of 20 hotels in Whitby and rated 4 of 5 at TripAdvisor. It does seem to me that if the Hobbit pub wants to claim that it had been there years before the films etc and that therefore they were not in breach of the other's copyright, then they should avoid using pictures from the films on their menus. On the otherhand, if they want to cash in on the free publicity (in the Guardian et al.) that the legal action by Paul Zaentz can bring, then using the pictures and refusing to chat over a pint seems just the thing to do. "Here Vroomfondel, why do we never think of things like that?" be too highly trained Majikthise." Back in the late 1970s, or early 1980s at the latest, I used to enjoy these chewy confections, sold at the Farmers' Market along Old Highway 99 between Ashland and Medford in southern Oregon. I think the Farmers' Market was technically in Phoenix, rather than Talent, the two towns between Ashland and Medford. These wrappers might be 40 years old. On his honeymoon in 1981, a friend took a moment to mail me some information about Tom Bombadil's Food and Drink, a restaurant on Alii Drive, Kailua, in Kona on the island of Hawaii. The decor included "wooden murals of scenes from the LOTR trilogy," Rosario said. He enclosed a leaflet printed on textured gold paper: "Tom's History featuring The True Story of the Discovery of Pizza," credited to Phineas Feathertree, "Grand Archivist of the Western Reach and Official Historian for Tom Bombadil's." The arch little account mentions J. R. R. Tolkien as having "documented" the "chronicles of the One Ring of Power." It continues: "Our brief history takes place in the region around the Shire, legendary habitat of Hobbitfolk and other strange creatures." The Shire "was in turmoil -- suffering an influx of foreign creatures such as Men, Grimmits, Yelches and even an occasional Gollabog. The voracious Grimmits had been glathering (sic) in from the dreaded Old Forest, raiding graineries (sic) and vegetable patches." Discussing the trouble at Nippo's Inn and Out House, four hobbits decide to do something. Whilst the meats are the food of the Yelches. And they'll devour each other to belches.'" The narrator tells that, sure enough, the Grimmits and Yelches fought over Bombadil's pizza, and that was the end of them. The leaflet is copyrighted 1977 by E. Todd Ellison. The restaurant emblem is a pair of stout boots. Rosario also sent the menu. The sandwiches have names such as The Middle Earth, The Rivendell, The Pride of Gondor, The Grey Havens (cheeses, alfalfa sprouts, etc. ), and Misty Mountains. Other menu offerings include include "a proud, heroic pizza," called the Aragorn, a sausage-and-mushroom pizza called the Shadowfax, etc. and salads such as the Lady of Lorien. The menu is copyright 1980 by Middle Earth, Inc. The restaurant emblem is a pair of stout boots. It would be nice to know if his boots were yellow. Do they serve a 2nd breakfast before lunch, lol? Is Lord of the Rings just an expanded version of The Hobbit?